A 76-year-old golfer rescued a drowning dog at a golf course. While she was going to her first hole of the day, she passed by a pond where she saw a small dog trying to keep her head above water. 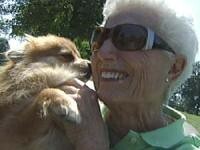 She took off her shoes and socks, jumped in the pond and rescued Lola the Pomeranian. Lola’s owner was moving and didn’t notice that she had run off. The golfer continued to play in her wet clothing after rescuing Lola. Fore! This entry was posted on Thursday, June 14th, 2007 at 3:52 am	and is filed under Dogs, National Dog, Cat & Pet Info, News for Cats, Dogs & Owners. You can follow any responses to this entry through the RSS 2.0 feed. Both comments and pings are currently closed. Hats off to the rescuer! Right attitude! Thumbs down to the airhead who didn’t notice the dog was missing!